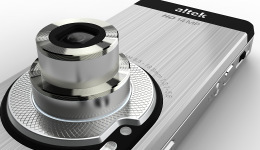 Altek announced the first 14 megapixel cameraphone capable of HD video recording and equipped with 3x optical zoom lens. Both Xenon and LED flashes are onboard and the best bit is that Leo will launch within a month. Altek Leo uses 14 megapixel CCD sensor and has all goodies a true cameraphone geek may want - HD video recording, Xenon flash, video LED flash and 3x optical zoom. The touch-driven Leo also packs Wi-Fi and 3G connectivity with HSPDA support, and these complete the known specs. 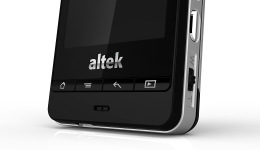 Altek presented the Leo as a smartphone but failed to mention the OS it is running. Yet, judging by the selection of buttons below the display we guess it will be packing some version of the Android OS. Altek promises to present and launch Leo during the CommunicAsia 2010 event in June. And don't worry if you haven't heard of Altek until today. The company is a digital camera OEM and their products are usually rebranded so they remain relatively unkown to the end-users. I found a site that sell this awesome camera phone http://www.fastcardtech.com/goods.php?u=42848&am­p;id=7254 buts its a little bit expensive for me..